Somali Cat, Cat Breed, the "fox cat"
My cat recently passed after gifting me 19 wonderful years.. I'm looking for another cat to keep my little girl company. She misses her brother very much. So please of anyone has or knows anyone thats selling tonkinese kittens please let me know!!! Hi It's nice to see this Cat... Where can I buy this cat and how much it costs.. This energetic Somali is a sight to behold, with its luxurious coat and fox-like appearance! Somoli's have a medium length ticked coat with a ruff and large tufted ears. But it's the nice fluffy tail complimenting the coat of this cat breed that gives it the look of a fox, and the name of Fox Cat. This coat and tail are quite beautiful. Fortunately this cats fur only needs a moderate amount maintenance. Since the coat is of medium length, it only requires weekly grooming most of the year. A daily grooming will only be needed during shedding season when the weather turns warm. Somalis love being around people, but can be rather insistent when seeking attention. Like the Abyssinian, the Somali is extroverted, athletic, very active, affectionate, and playful. Some sources state that this cat breed is hardly distinguishable in personality from the Abyssinian, while others say it is calmer and less demanding. It has a soft voice and is usually quiet. This is an intelligent breed that often opens cupboards, and can even learn to turn on faucets. This cat breed is a good mouser and enjoys running about outside. Yet the Somali Cat is sensitive to the cold, and some even appear to be afraid of the cold. The Somali Cat found in the pet industry today was developed in America under a breeding program started by Evelyn Mague in 1967. In the United States, it was fully recognized as a breed by the Cat Fancier's Association (CFA) in 1978. By 1982 it was approved by the Fédération Internationale Féline (FIFe) in Europe. It is currently available in America, Europe, and Australia. Background The Somali cat is a natural cat breed with an interesting development. Semi-long haired Abyssinians began appearing in the 1950's and 1960's. At first, these individuals were regarded as accidents and kept out of breeding programs. However by 1967, Evelyn Mague, an American breeder, recognized the appeal of these cats and began a breeding program, starting with "George", the founding father of the Somalis. Evelyn Mague named the breed after Somalia, a neighboring country with Abyssinia (present-day Ethiopia). This name had nothing to do with the breed's geographic origins. Somalis are believed to originate from Ethiopia, just like the Abyssinians. But her name simply reflected the closeness of the Somali and Abyssinian breeds, since Somalia and Ethiopia are neighboring countries. There are two main theories that exist concerning the cause of the long-haired mutation found in the Somali. The first is that it was a spontaneous mutation. This theory is supported by the fact that Somalis and Abyssinians share most of their characteristics, save their coat length. The other theory is that the mutation originated from crossings between Persians and Abyssinians in the 1900's. This is held as the main theory by several cat breed experts. No matter its origins, the long-haired characteristic of the Somali gives it a uniquely feral appearance. 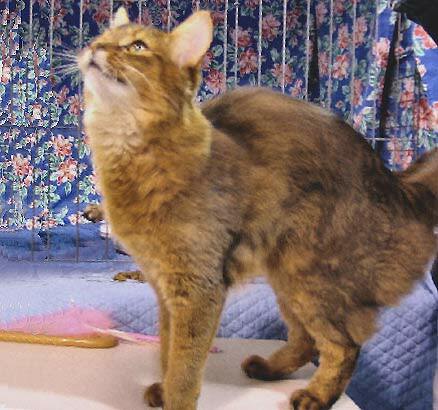 The first Somali was shown at a cat show in 1972. It was recognized as a breed by the Cat Fancier's Association (CFA) in 1978. By 1982, it was approved in Europe by the Fédération Internationale Féline (FIFe). Common names for this natural breed cat include Somali Cat and the "fox cat". Description The Somali cat is prized for its fox-like appearance, which is created by the medium length of its ticked coat, fluffy tail, ruff (thick collar), and large tufted ears. Other than the coat length and tufted ears, the Somali is very similar to the Abyssinian. This is a medium-sized cat breed, slender and long with a muscular build. The back is slightly arched making it appear like it is readying to leap into the air. The head is a slightly rounded wedge.The markings on the face create the appearance of a mask and smile. The eyes are large and almond-shaped and the ears are large and moderately pointed. The legs are long and thin. The tail is of moderate length, is thick at the base, and slightly tapers. They weigh approximately 9 to 16 pounds and live approximately 12 years. The Somali has a semi-long coat with a thick undercoat. Like the Abyssinian, each strand of the Somali's coat has different bands of color, which is referred to as being "ticked". The Cat Fancier's Association (CFA), the main cat association in the United States, only recognizes the more wild looking color variations: Ruddy, Red, Blue, and Fawn. The Governing Council of the Cat Fancy (GCCF), the main cat association in England, accepts those colors, along with Sorrel, Chocolate, Lilac, and Cream. It also accepts Tortie, Silver, and Tortie Silver varieties of those colors. The silver varieties are characterized by a white undercoat. Care and Feeding Somali Cats have no special feeding requirements, though they particularly enjoy eating meat. Housing Your Cat Like the Abyssinian, the Somali needs a large area to run and play in. For this reason, it is not an ideal apartment cat. It needs time outside, whether on a large terrace or a yard. It will also enjoy being able run about in a large house, if available. Maintenance This breed has moderate grooming requirements. During much of the year it only needs a weekly brushing, though during shedding season when the weather warms up, it needs to be brushed daily. Social Behaviors This is a social cat that demands attention from its owner. They are highly intelligent, playful, and loyal. They are inquisitive and interested in their surroundings, and love to be involved in family activities. It is playful and gentle, which makes it a good cat for children. This cat breed also gets along with other cats and strangers. Activities This breed craves exercise and activity and enjoys playing both inside and outside. This is an active that needs time to run about outside. It is also an inquisitive cat that thrives with interactive play, such as fetch. They are even capable of learning tricks. They need a variety of toys and a scratching post for indoors. Breeding/Reproduction Somali litters usually contain 3 or 4 small, dark kittens. Kittens develop slowly, reaching their full size and obtaining their long coat and permanent color at about 18 months. Common Health Problems Somalis are generally hardy. Like Abyssinians, they should be checked regularly for gum inflammation (signs of gingivitis). Gingivitis is an inflammation of the gums and is characterized by a red line of gum tissue on the border against the teeth. It can cause the gums to bleed, and produce larger red areas in more severe cases. There is no cure for gingivitis in cats. Antibiotics, ant-inflammatory, and immune-suppressive drugs and removal of tarter from the teeth are often used to treat this condition. To prevent gingivitis, owners can feed their cats food intended to prevent dental problems and regularly brush their cats' teeth. Availability The Somali is fairly rare compared to other breeds in the cat fancy world, but breeders can be located on the internet. Prices start at around $800 and can reach far higher than $1000. This article describes our Somali purrfectly! They are wonderful buddies to have and you WILL fall in love for life! Andy loves to play-hunt with his feather toy so much that he has even been known to wake us up in the middle of the night by bringing it to us while we're sound asleep and head-butting us awake for attention & to play. He's too sweet to be grouchy over this though. He looks and sounds very sweet & gentle and completely tuned to my every mood - But make no mistake - an attentive and dangerous bird-hunter he is! (a bug will do in a pinch). We love you Andy!! Oh, did I mention that they LOVE to play with water! They are strange, lovable little critters. The Abyssinian breed most certainly did not originate in America! My cat looks exactly like the one in the picture. We call her Musang. She is very playful, active and seeks attention. She likes to hide inside cupboards and sometimes we cannot see her since her fur is like a camouflage. She takes boiled or raw fish daily. She does not like friskies or whiskas. She roams about in the garden and catches mice, cockroaches and even insects like the mosquitoes and flies and keep them in our shoes. She is recently friendly with a brownish male cat looking a bit like a junior lion which we call Samba. We are very happy with her and love her so much.